Who was Sister Olga Romanov’s beloved “Mitya” Shakh-Bagov? 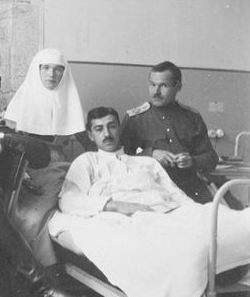 Left to right: Sisters of Mercy Tatiana Romanov and Olga Romanov with the wounded at their infirmary. Mitya Shakh-Bagov is at Olga’s upper right. Dmitri Artemevich Shakh-Bagov (aka Shakhbagov) was born on February 9, 1893. He attended a gymnasium and spent his summers in Manglisi, where His Majestry’s 13th Life Yerivan Grenadier Regiment was stationed – the oldest and one of the most prestigious regiments in the Russian army. 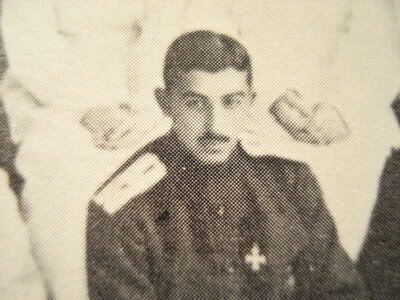 Shakh-Bagov was wounded in action on 19 May of 1915, and five days later arrived at the Tsarskoe Selo infirmary. Here worked the imperial “Sisters of Mercy”: Olga Romanov and her sister Tatiana. For the young grand duchesses this was arguably one of the most exciting periods of their lives, one that they would always remember fondly. Their daily work was all in the name of Russia’s victory; and in between they were playing croquet, ruble, checkers, ping-pong, enjoyed conversations, concerts and movies, and made interesting new acquaintances: among them so many young handsome officers. 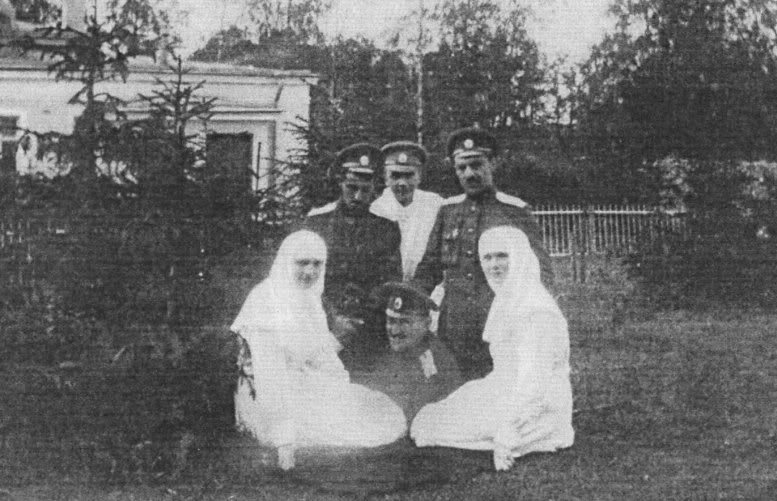 Sister Olga Romanov and Sister Tatiana Romanov with their wounded, including Mitya Shakh-Bagov, standing between the sisters. 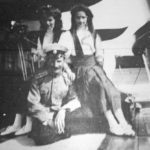 The new patient – a young sweet and shy ensign – quickly became one of the grand duchesses’ “favorites”: “He’s so sweet, such a darling little dear… ” – the Romanov sisters both noted in their diaries. Soon it became obvious that Shakh-Bagov benefitted from his new acquaintances – intentionally or not. In the memoirs of other “Yerivantzy”, they described a curious case: one of the young convalescents, while playing croquet with Grand Duchess Olga, complained about the problems associated with changes in his regiment. Olga told her mother, Empress Alexandra, who wrote to the Tsar, by whose orders the problem was soon resolved. 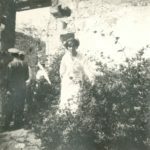 The officer’s name was not specifically mentioned, but Empress Alexandra’s letter was dated June 22, 1915, while in the diary of Grand Duchess Olga from the previous day, she mentioned that she was playing croquet with Mitya. Mitya‘s stay at the infirmary ended quickly: a month later he was discharged. “Our Yerivantzy are getting well too fast, and tomorrow the sweetest of them is returning to the regiment, which is very sad,” Grand Duchess Olga wrote to her father, Nicholas II. According to witnesses the departure of her favorite patient noticeably upset Sister Olga Romanov. “Very lonesome without little darling Shakh-Bagov“, she wrote in her diary on June 23rd, 1915. And what was Dmitri feeling at the time? “I am going to the front: if I do not return with the St George [medal], then they will bring me on a stretcher …”, he reportedly said to Ivan Belyaev, another wounded officer, before his departure. Mitya did indeed receive his St George, and also returned to the infirmary rather quickly. He was more seriously wounded in July of 1915. Shakh-Bagov hurried to send a telegram asking for permission to return to the familiar infirmary and of course received it. 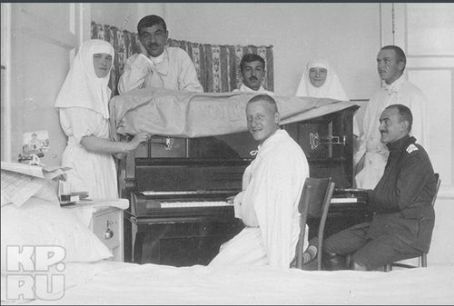 He was back in Tsarskoe Selo in early August, to the undoubted delight of one nurse in particular: Sister Olga Romanov. Belyaev remembered that Mitya “was brought in with a fractured leg, on a stretcher, emaciated and pale“. Grand Duchesses Olga and Tatiana immediately had him transferred to his old bed in the “Yerivan room”. Having undergone surgery, his entire leg was in plaster but Mitya almost immediately started to get up and try to walk. “It soon became evident that the good mood of his August nurse had returned and her lovely eyes sparkled once again,” Belyaev noted. 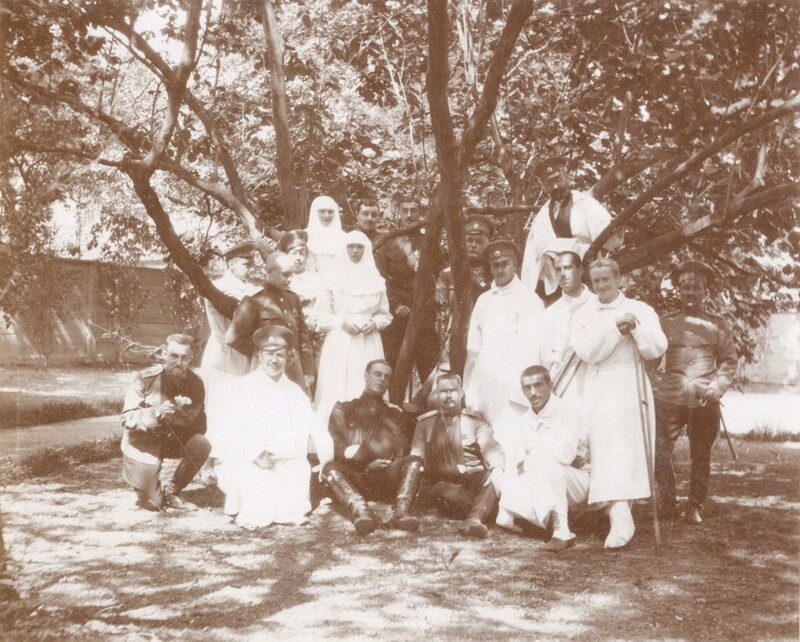 Sister Olga Romanov and Sister Tatiana Romanov posing with the wounded officers . “Mitya”: Dmitri Shakh-Bagov is on the left. 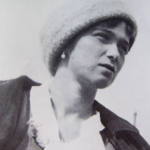 Mitya‘s name started to appear more and more often in the diary of Sister Olga Romanov. She wrote about his wounds, his treatments, and their conversations – in person and on the telephone. Mitya seemed to never be far away from the young Grand Duchess’s thoughts. “He was incredibly nice and cheerful as ever – so precious. May the Lord save him“, wrote Olga Romanov on 3 September, 1915. Together the young imperial nurse and her patient looked at photo albums sitting by a window, and often played table games like checkers. He entertained her with conversation while she was drawing or knitting; on Sundays and holidays they saw each other in church. “Awfully glad to see him … so cozy … So nice” – this was Olga Nikolaevna’s usual mood in the autumn of 1915. 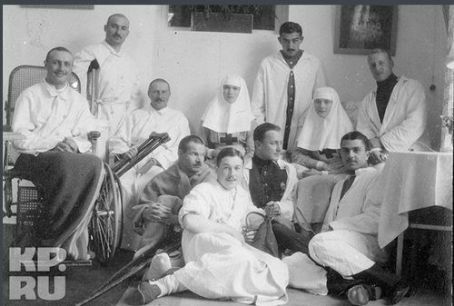 It is difficult to draw any definite conclusions about the depth of Grand Duchess Olga’s feelings towards Mitya based on her restrained diary entries, but the infirmary staff and patients alike drew many conclusions, regardless. “It was all very obvious, so sweet, these wonderful girlish years, an innocent girl’s heart“, Belyaev gushed. 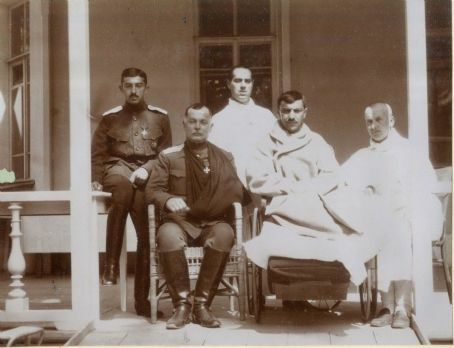 The wounded at the imperial infirmary, Mitya Shakh-Bagov is on the left. “It was evident that he was completely in love with his nurse. His cheeks glowed like a bright flame whenever he looked at Olga Nikolaevna“, recalled Belyaev. There was at least one unpleasant incident: “Vera Ignatievna [Chebotareva] told me that while drunk Shakh-Bagov showed someone a letter from Olga Nikolaevna. That’s all we needed! Poor baby! “, outraged Chebotareva wrote, wary of romances between the grand duchesses and the wounded officers. However, there was hardly anything personal in those letters, it was more like “how are you doing” in the style all the grand duchesses usually wrote. The entire Romanov family was aware of Grand Duchess Olga’s attachment to Mitya, who was often invited to the Alexander Palace for tea, along with some other officers. He was familiar with all the members of the imperial family: once he sent Grand Duchess Maria a birthday card, and occasionally chatted on the telephone with Tsarevich Alexei. Empress Alexandra repeatedly mentioned him in her letters to the Tsar, as if he were a regular family friend. 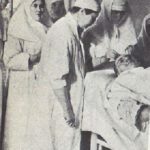 It is strange that Nurse Chebotareva and Doctor Princess Gedroitz feared that romances with the wounded officers would compromise the grand duchesses, while their mother, Alexandra, seemed to have encouraged these relationships. Did the Empress only see this innocent friendship in all of that and nothing more? After all, once the war came to end, marrying a simple officer would be out of the question for a Tsar’s daughter. This position was very good for a junior officer. Almost a year later, in December of 1916, Grand Duchess Olga noted in her diary that Mitya “received the second Company of the battalion recruits. [He] is happy“. Mitya did not forgot his friends in Tsarskoe Selo either: he regularly corresponded with them, mainly through VA. Vilchkovskaya (“Bibi”). Mitya also visited Tsarskoe Selo a few times, accompanied by his mother, and later a fellow soldier Boris Ravtopulo. During these visits he came to the infirmary almost daily; as in the old days he and Boris helped the Grand Duchesses in the prep room, and spent time in a very “cozy” and fun manner. 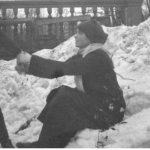 Again Mitya had the chance to spend long evenings talking alone with Olga. “The days pass like one hour while Mitya is with us“, the Grand Duchess wrote. After the revolution, the riots did not immediately affect the Yerivan Regiment: for some time it managed to maintain a relative calm. 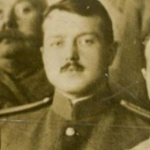 But by summer the situation became unbearable to the officers, and in June, Lieutenant Shakh-Bagov left his regiment, like many of his comrades. It is unknown where he went at that time, it is only known that he and Olga sometimes managed to get news about each other. “What are Mitya and Volodya up to?”, asked Tatiana Romanov in her letter to Chebotareva, from house arrest at the Alexander Palace (01/04/1917). There was also a mention in a letter Olga wrote from Tobolsk: “Kupov wrote [a letter]. He saw Mitya and Boris in Petrograd. They sent us regards “(04/19/1918). What was he doing in Petrograd? Where did he go after that? It is unknown. 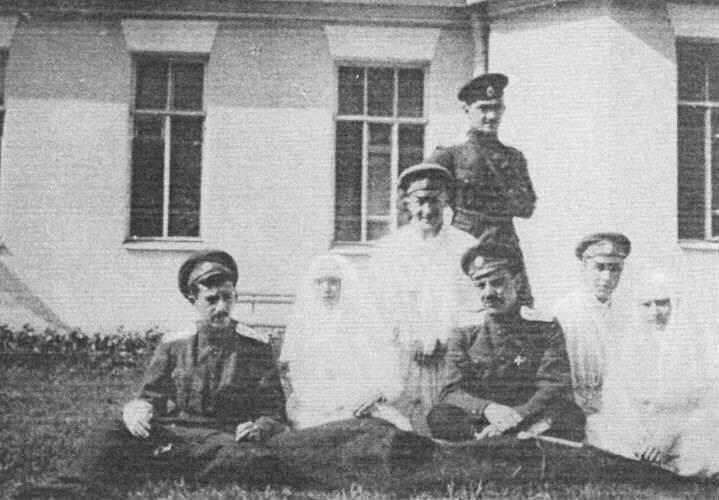 Sister Olga Romanov (center) and Sister Tatiana Romanov posing with the wounded officers . “Mitya”: Dmitri Shakh-Bagov is on the left. What was in store for Olga Romanov after that is now all too well known: Yekaterinburg, her murder, the canonization many years later. But what became of her “darling Mitya”? We know that Shakh-Bagov’s closest friend Boris Ravtopulo served a few terms in work camps in the 1920s and 30s. But any trace of Mitya was unfortunately lost. There was only one interesting reference: in the autumn of 1920, when the Red Army was almost victorious in the South Caucasus, one of the few forces able to resist it was a detachment in Echmiadzin commanded by someone named Shakhbagov. Is it possible that it was Olga’s “Mitya“? Given the rarity of the last name, the place, the time, the type of activity and political position, we can perhaps assume that it was either Mitya, or one of his relatives . ROMANOV FAMILY: ON THIS DATE IN THEIR OWN WORDS. OLGA ROMANOV. FEBRUARY 21, 1917.